A gang of motorcycle-riding suspects allegedly involved in a series of snatching incidents here in the city were finally arrested by police officers. Police Capt. 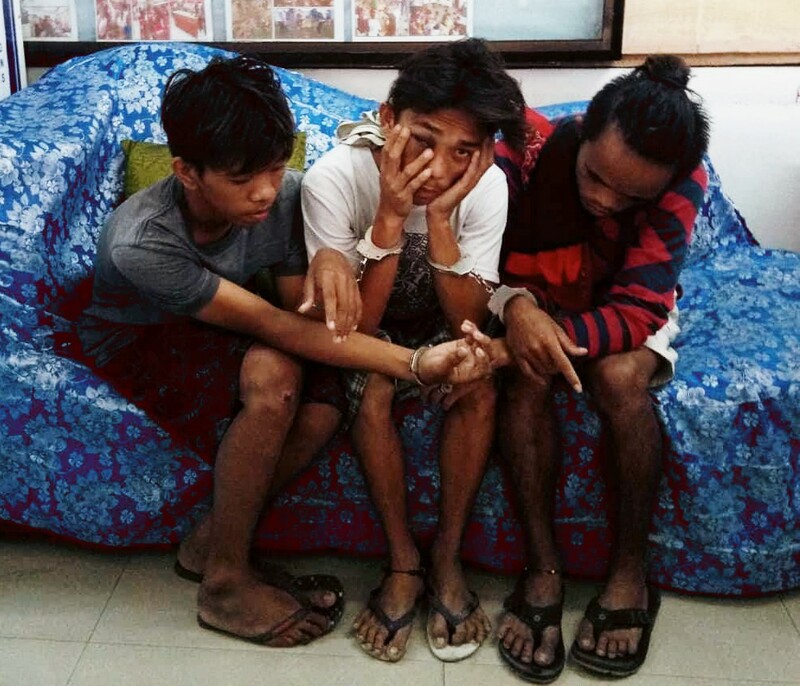 Rogie Ortencio, Divisoria police station chief, identified the suspects as Benjack Ebarat, 19, a resident of Celrai, Macabalan; Agustine Epanis, 20, same place; and Christopher Muit,18, Zone 8, Bulua, all of this city. Another gang member, a certain Jeffrey alias Taloloy of Barangay Bulua, was able to evade arrest. The suspects were arrested while at Zone 8, Bulua at about 8 pm Wednesday. The arrest came after a certain Victoria Dayata was victimized by the suspects on Monday. Dayata said while she was walking at Gaerlan-Velez streets, the suspects, while riding a motorcycle, suddenly appeared from behind her and forcibly snatched her bag. The incident happened at 3:30 pm, March 18. Recovered from the suspects were a TVS brand motorcycle without a plate number. Inside the utility box, police found two sachets containing alleged shabu, several drug paraphernalia, two kitchen knives, three mobile phones, and a live bullet. Dayata said she is pushing through with filing charges against the suspects so they would spend jail time for years. However, Muit denied being a member of the gang. He said he was outside his residence purposedly to buy viands when the police arrived and arrested his two friends included him as he was in the area during the raid. Muit, however, told a police investigator that Epanis and Ebarat were into nefarious activities with Jeffrey. Ebarat admitted the crime but pointed Jeffrey as the mastermind. Ortencio said the suspects are slated to face an inquest yesterday at the City Prosecutor’s Office. Ortencio calls on other people who have been victimized by the gang to come out of the open and file their own case against the gang. The suspects are temporarily detained at Maharlika jail.